Not all clouds are created equal. There is no-one-size-fits-all cloud approach; we have expertise in Public, Private, and Hybrid Cloud models. 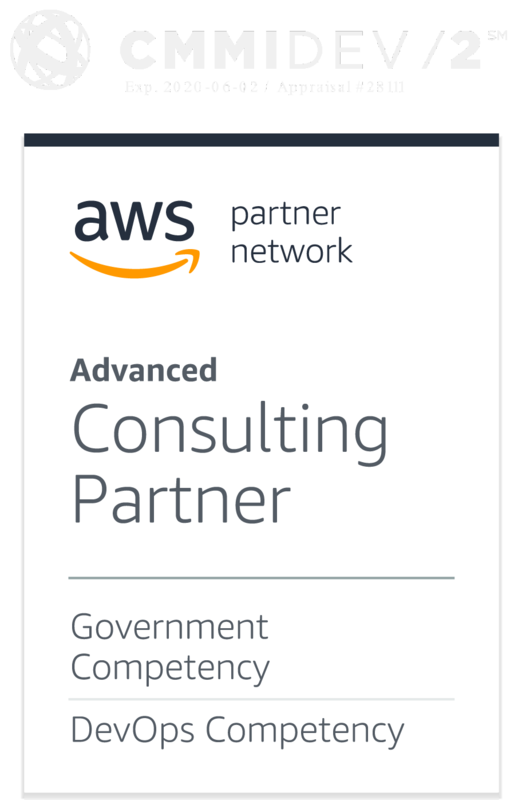 CTAC is an AWS Advanced Partner (with a Federal Letter of Supply on our GSA Schedule) as well as a Microsoft Azure, RedHat Cloud, and QTS Partner with the proven expertise to guide you towards the cloud solution that is right for you. CTAC’s expertise allows us to evaluate each situation systematically and determine the best approach based on a client’s unique needs. CTAC has architected and delivered custom cloud solutions for more than 14 agencies, including HHS, GSA, CPSC, CFTC, DOT/NHTSA, and the FDA. Our certified Cloud Solution Architects will review and evaluate infrastructure, availability, scalability, and security needs for new and existing enterprise applications. CTAC’s focus on cloud orchestration and serverless architecture allows for enhanced scalability, lower infrastructure costs, decreased time-to-market, and an improved user experience, allowing you to focus on what you do best; delivering to your customers. CTAC has implemented full-stack, multi-tenant, enterprise PaaS and SaaS solutions for large agencies while supporting multiple technology stacks. CTAC understands the challenges of FedRAMP, having participated in a 3PAO audit as a prime contractor. We specialize in Virtual Private Cloud (VPC) network design and Virtual Private Networks (VPN). CTAC architects software-based, token-based, dual-factor authentication schemes, as well as point-to-point hardware and VPN solutions. We’ve designed client-specific, modularized, streamlined, and secure digital services across the enterprise. When HHS needed to migrate over 100 mission critical applications and public websites to the cloud, CTAC made the transition seamlessly, eliminating the need for on-site servers. Beyond “lift and shift,” we help our customers fully optimize their cloud environments. We help our customers transition from complicated, manually-managed environments to flexible cloud environments. Automated provisioning, scaling, deploying, and monitoring result in improved performance, reduced over-provisioning, better resource utilization, and overall cost savings. Our approach to migration can range from a traditional “lift and shift” operations, to re-architecting from ground-up for the cloud with advanced automation and DevOps. Each approach is tailored for the situation and specific organizational needs. Our team uses the latest technologies and — where possible — vendor APIs, to improve migration quality and reduce risks. CTAC has migrated and optimized workflows, content management systems, APIs, health datasets, and data analytics. HHS saved 85% on their infrastructure costs by leveraging CTACs experience building “infrastructure as code” environments with powerful and secure virtual networking. While some “value-added” vendors simply spin-up servers, we provide full-scope navigation through the complex ATO process for our clients. We work directly with security teams to eliminate bottlenecks. We provide continuous scanning and penetration services. CTAC uses industry standard, best practice security and encryption on all applications and data – compliant with NIST, FedRAMP, and HIPAA regulations. Our ability to provide 24/7 surge support is demonstrated by our recent collaboration with the GSA during the 2016 election cycle — the “Blue Site” or “Red Site” had to be live within two hours of the election results, and maintain a 100% uptime. CTAC delivered with GreatAgain.gov.